Decorate your lair or crypt with this dainty and ornate cross stitch design! 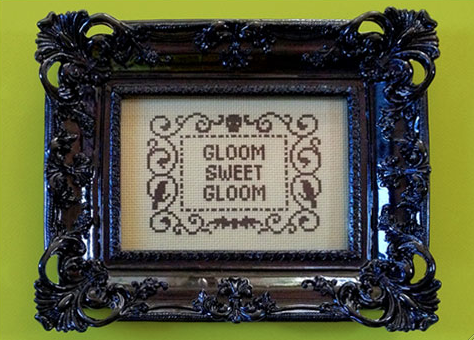 From world famous internationally known and celebrated graphic designer for film and television comes Dianne Chadwick’s excellent downtrodden and hopelessly gloomy needlepoint project! Is your mausoleum feeling too cheery? Are lighthearted and gleeful sentiments seeping into your sarcophagus? Well banish the warmth and joy once and for all with this absolutely capricious and morosely lovely craft project! This wonderful design contains a “down home sophistication” with its swirls that harken back to a more ornate time period, while also staying focused on the important things like skulls, crows and bats. 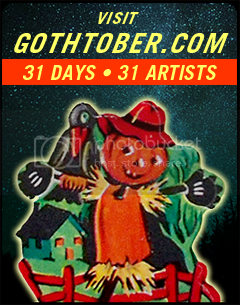 We made sure to launch it on the Calendar on the 3rd, to give you plenty of time to download the pattern by clicking on Pumpkin #3 on The Gothtober Countdown Calendar, then geting your supplies and sewing your heart out before Halloween! We’ve even given you enough time to make this if you’ve never done needlepoint before. Now is a swell time to try a new hobby, start today! AND if you want to see more of Ms. Chadwick’s awesome Halloween-oriented art, take yourself to October Shadows on October 13th Mountain View Mausoleum, 2300 N. Marengo Avenue in Altadena, CA 91001 It’s a big fat showcase of artists from the worlds of fine art, comics, film, TV and animation! The show will run each Saturday and Sunday from 10am – 3pm through November 3rd. And, speaking of Halloween, it’s time to start thinking about your Halloween costume! Have you been brainstorming? While you sit and work on your needlepoint, have a conversation with yourself about what you’re going to wear at all those costume parades you’re sure to march in this autumn. The hot ticket predictions (According to the National Costume Prognostication Society) you’ll be seeing this October 2012 will be (of course) Obama and Romney lookalikes, followed by PSY, the Korean Rapper who hit the big time with “Gangam Style” and you’ll probably see a lot of Lady Gagas, Nicki Manajs or Kim Kardashians. If you’re looking for big cash at the costume ball, avoid these, they’ll already be everywhere. Of course, if you’re going to rock Gangam Style, show up with the entire cast of characters (or even just the dude in yellow with the bowl cut) from the video and blow everyone away with your awesome dance moves. Bring 12 blowing fans to make it authentic! It is also a fact that pet owners nationwide spend about $370 million on costumes for their furry friends. If you have somehow gotten yourself embroiled in a high stakes pet costume contest: steer away from the hot dog, devil or pumpkin, as those are the most popular. Go for robot, taco or “Alpine Girl” and you’ll have more luck.